The labor of love and devotion that is Isola is on full display with every page in the new issue. Creators Brenden Fletcher and Karl Kerschl are truly creating something special with this book. The dialogue continues to be natural and rewarding, the art proves subtle, yet beautiful, and the story ebbs and flows so deliciously that no real expectations from page to page can truly be made. Each element of storytelling can be stripped away from the others and analyzed, but each proves to hold its own individually, as well as in the tapestry of storytelling. 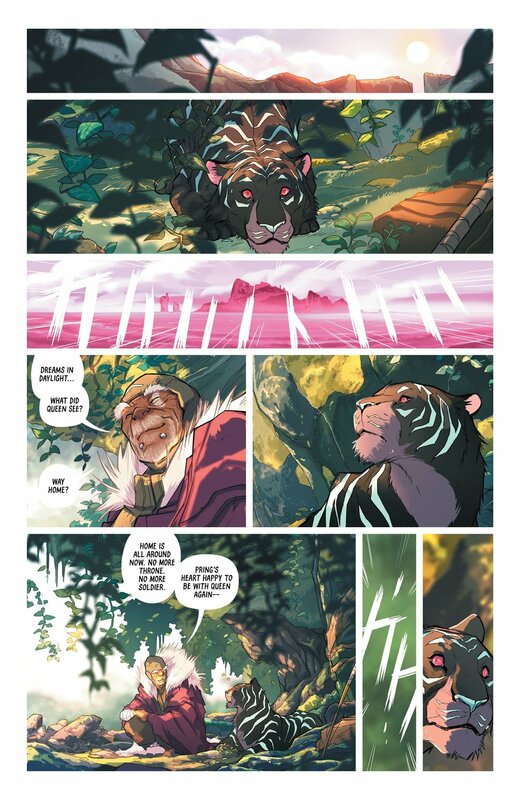 Isola is proving to be a symphony of creative talent in not only Fletcher and Kerschl, but in colorist Msassyk and letterer Aditya Bidikar as well. Each proverbial “sound” the individual artist may play lay in perfect pitch with the overall melody upon the page. There’s something refreshing about experiencing collaboration in where every collaborator is emotionally involved. Issue two seems to pick up not long after issue one, but there is definitely a small amount of lapsed time. Rook and Olwyn have been pushing themselves as their supplies have dwindled. As the queen Olwyn collapses, it’s up to Rook to explore a nearby city which lay in ruin. In the meanwhile, the hunting-clan has lessened the distance on the companions and grows ever closer in their position. The conflict within the story, both internal to each character as well as the external conflicts set upon them, never go away. The moments that which feel the safest are often first to result in agape mouths and hanging jaws. Conversely, the most dangerous moments dripping with tension seem to turn toward the surprisingly safe route, yet still manage to leave the reader with lips parting under the weight of dumbfounded jaw. There are so many elements within Isola that are simply just fantastic. Each and every frame of this issue, the same as with the first, seems meticulously crafted. The dynamism of the frames as they cant to help denote danger, or the racked focus and foreground elements, which create depth usually found in cinema, all adds to this subtle, but most enjoyable peering through the metaphorical key hole experience. The dialogue is natural and owned by the character from whence it comes. Even in moments of exposition, it never feels spoon-fed. The dialogue flows naturally and reveals its messages sub-textually. The experience is one of reward and not in the vain of dumbing down storytelling. Isola is a taste for a deeper palette, one that savors rich flavors intermingled. This book is so well-crafted that any element could be stripped away from it and the book would still be just as engaging and enjoyable. That is the true testament to the storytelling, as well as the talent, and the love behind Isola.